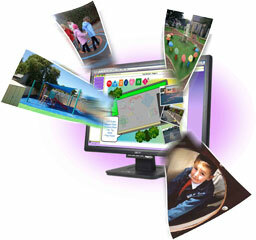 Create your own play area with our online playground design tool! It's easy to use - simply draw in a map of your play area (or we can download a satellite photo of your school playground) then simply drag-and-drop items from our extensive selection of playground markings, wallboards and other fun and educational products. To gain access to the online playground designer software, simply fill in the form below and we'll get in touch with login details. We are sorry but due to copyright of our marking designs, we are currently unable to to do this outside the United Kingdom.